With medieval towns, stunning countryside, and quiet country lanes, Catalonia is an ideal destination for a cycling holiday. Here's what you need to know about cycling in Catalonia. When the Catalonia Tourist Board said they would like to invite me to the region to do some cycling, of course I jumped at the chance! Spain was one of the few European countries I had never cycled in before, and Catalonia an area I had previously visited, but always wanted to see more of. 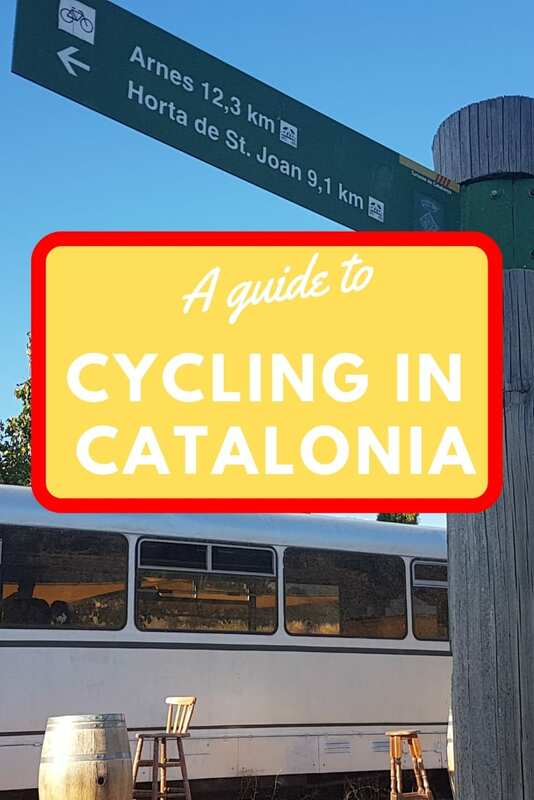 Over the course of a week, I experienced some of the different options for cycling in Catalonia, and want to share with you 4 ideas to explore Catalunya by bike. You could use some of these suggestions of cycling on day trips from Barcelona, or plan long weekend breaks around them. The choice is yours! Before going on to describe some of the different cycling opportunities in Catalonia, it is probably worth talking about the best time of year to visit. I visited in September, with the season just on the edge between summer and autumn. This meant that some days were warm, but that rain also threatened for a couple of days. In fact, rain did ‘stop play' one day, when the organisers decided that we shouldn't cycle. Apparently though, Catalonia rarely has rain days so bad you can't cycle – about 11 or 12 according to sources. With that in mind, I would say that the months of June and September are the best for cycling in Catalonia. As you will discover later though, you can cycle all through the year, and one place is specifically set up for hosting groups for autumn and winter cycling. Regular readers will know that my preference when it comes to cycling is bicycle touring. On this occasion though, I undertook several different short and medium length rides in different parts of Catalonia. Doing this made me realise there are options for cycling in Catalonia for people of all ages and abilities. Below, I've put down 4 ideas starting from casual tourists who might like to have a pedal for a few hours, to more dedicated cyclists looking for cycling holidays in Catalonia. Cycling purists might not like it, but the next big revolution in cycling is the e-bike. Electrically powered bikes have gained in popularity as their efficiency has improved and weight lowered. I first noticed this with German and Dutch motorhome owners. In the past, they would have normal bikes on the back of their vans. Nowadays, it is far more likely to be an electric bike. This is now spreading to bicycle hire firms, who offer electric bikes as a way to see an area. With the weight of a motor 3kgs or less, and a range of 60kms or more, it opens up an entire new opportunity for the tourism industry. First time on an e-bike! 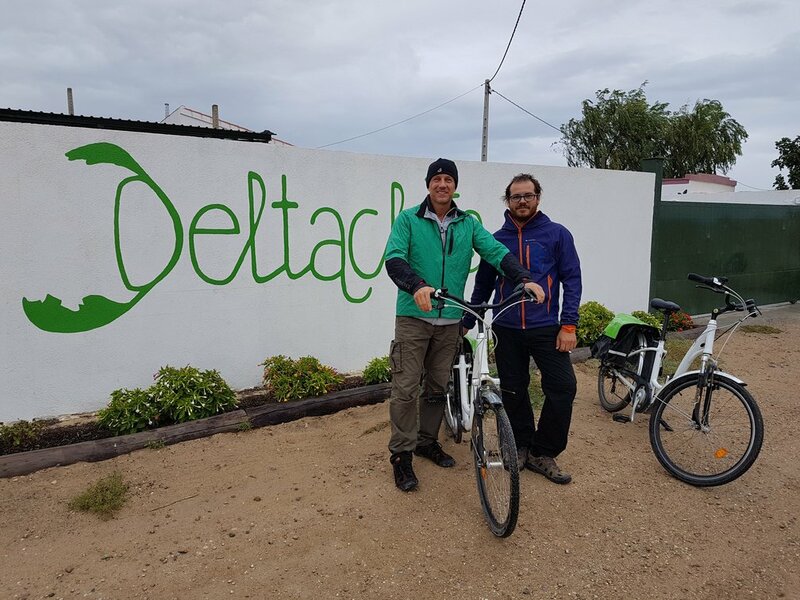 I'd never been on an e-bike before visiting Catalonia, and so cycling with Deltacleta through the beautiful Ebro Delta park was a nice initiation. It was possible to comfortably cover 20-30kms in a reasonably short amount of time, enabling us to see some of the wildlife the delta is famous for. Hiring e-bikes is a perfect choice for families with younger kids, or people unsure of their fitness levels. You get the benefit of fresh air, exercise, and can use the electrical assistance whenever you want. It's also great fun! Find out more about the Ebro Delta and Ebre River here. There are plenty of places you can hire a bike to go cycling in Catalonia. Whether it is in the main city of Barcelona, or the small towns which dot the countryside. 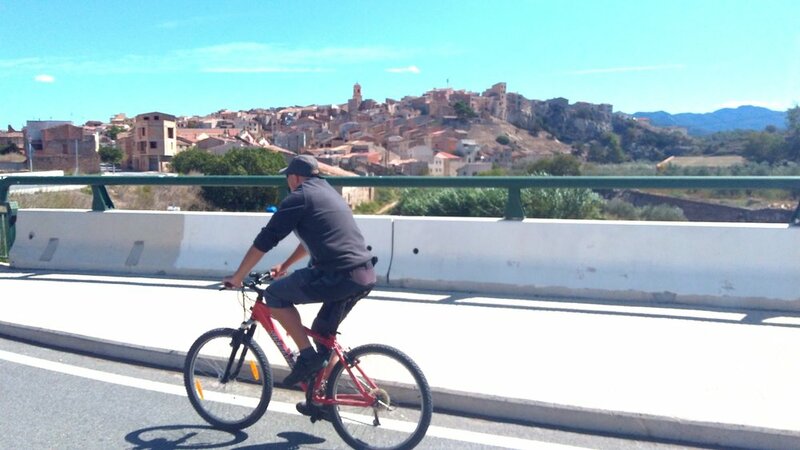 During my time in Catalonia, I used a hire bike provided by Drac Actiu to cycle from the historic town of Montblanc to the Monastery at Poblet. I'm not sure if their website is in English, so you might also want to check out the Montblanc tourism office who can point you in the right direction. I used a regular mountain bike for the ride, although the company does also offer e-bikes as well. The ride followed part of the MTB GR175 Cistercian Route, a route that connects three monasteries in the area. The entire length is 108kms, probably best completed in 2 or even 3 days to allow for sightseeing. From Montblanc to Poblet Monastery, it was just 12 kms though! This short journey was not technical, and easily completed by anyone with a moderate level of fitness. There are countless other mountain biking possibilities all throughout Catalonia. I think that my favourite experience of cycling in Catalonia, was along one of the Greenways. Also known as Via Verde, there are four of them in the region. 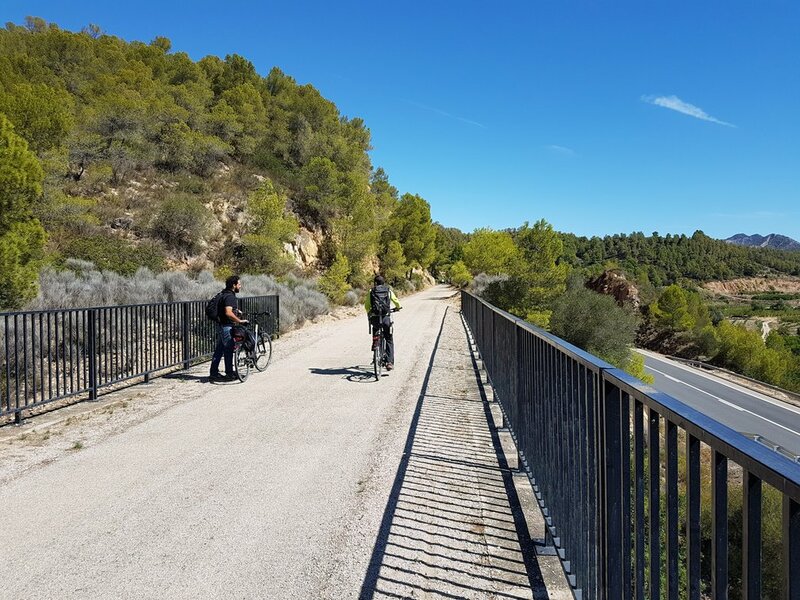 They generally follow along or over old railway tracks, and provide safe, traffic free cycling through the Catalan countryside. The route that I took started in Tortosa, and finished in Horta Sant Joan some 67 kms away. Apparently, there are two ways to do the route. ‘Uphill', and ‘Downhill'. We evidently went uphill, as there were 1700 metres of total ascent throughout the day! That said, we were cycling at a nice relaxed pace, and even stopped off for a two hour lunch at a Cathedral of Wine. (Yes really! More about it in a later blog post!). I think the Greenway cycle ride is an excellent one to try when in the region, although most people may prefer to cycle in the opposite direction. Talk to the team at Estacio de Xerta about bike hire, and also vehicle transfers so they can take you one end, and you can finish at another. Electric bikes are also available! If you are going to do the ride yourself as you are already cycling in Catalonia, remember to bring some lights for your bike. The greenway goes through a series of tunnels, and not all of them are brightly lit. Before this trip, I had no idea that road cycling in Catalonia was really popular with British cyclists. That changed when I visited Cycling Costa Daurada at Cambrils Park Resort. Each year during the autumn, winter, and spring months, cyclists of all abilities come from the UK to stay at the Park. They spend their days cycling in the hills and countryside, and their evenings refuelling with great food and a beer or two! The park is popular with semi-pro teams, as well as enthusiastic amateur club riders. 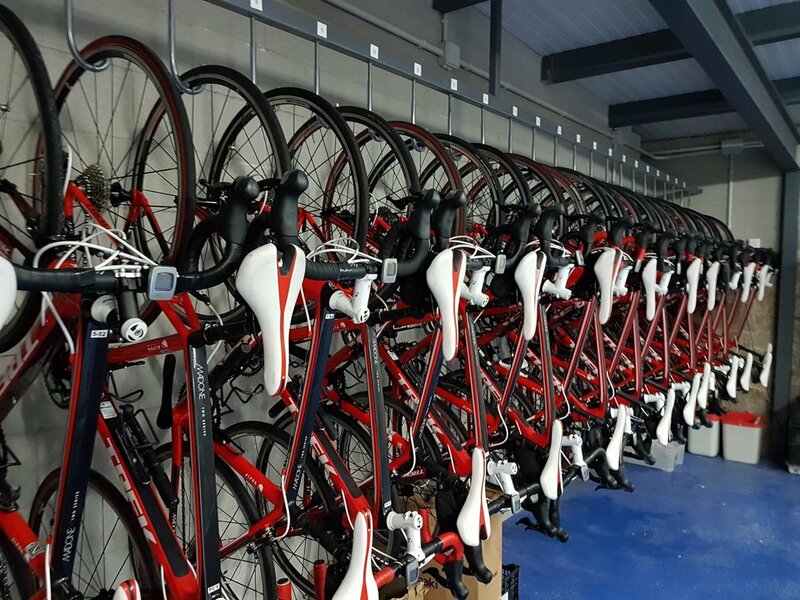 They have all the facilities you might need from a training camp, including secure bike storage, bike hire, bike repair, transport, support, accommodation, and more. I was due to go on a road cycling loop with cycling Costa Daurada to see for myself what cycling in this part of Catalonia is like. As mentioned at the beginning of the article however, this was the day that rain stopped play. Not to worry though – it's there for next time! Has this blog post inspired you to find out more about cycling in Catalonia? This site has some great information, and is a good place to begin planning your next cycling holiday in Catalonia. I'll be writing a couple more blog posts about my time in Catalonia over the next few weeks, so sign up for my newsletter to be informed when they go live! Disclaimer: I was provided a complimentary trip to Catalonia by the Catalonia Tourist Board, but all opinions are of course my own. I'm sure you'd expect nothing less from me! Have you spent time cycling in Catalonia, or would like to ask me anything? Please leave a comment below!